Day 1: Arrival at Trivendrum and Transfer to Kovlam Hotel Over Night stay. Our customer care representative will receive you on arrival at Trivendrum Airport Pick up and Transfer by Luxury coach to Hotel At Kovlam just 18kms. From there.Check in Hotel and take rest evening visit the Light House ,sun set view on the Kavlam Beach Over Night stay at Hotel Kovlam. Morning after breakfast go for a half day sightseeing of Triavndrum city covering the Padmanabha Swami Temple, Horse Palace and Zoo. Rest of the day at leisure to enjoy the beaches of Kovalam. Day 3: Kovlam to Kanyakumari. After Breakfast we drive down to Kanyakumari (95 KM/ 3 hrs) on arrival check into the hotel in Kanyakumari. After some rest visit the Gandhi Memorial, Vivekananda Rock, Devikanya temple and return back to Hotel after seeing the sunset from the southern tip of India. Overnight stay at the Hotel Kanyakumari. After morning Darshan move to Rameshwaram (310 Kms / 8 Hrs).After check in to Hotel take rest & then visit evening aarti etc. Over night stay at hotel. After breakfast drive to Madurai (170 Kms / 5 Hrs). Transfer and check in to hotel. After check in at Hotel proceed to temple tour including afternoon visit Madurai Meenakshi Temple, Chokanadhar Temple, Alagar Temple, Lord Muruga Temple etc. Overnight at hotel. After break fast proceed for local sight seeing.Kodaikanal is one of India's best known hill stations situated amidst the sylvan grandeur of the Palani hills an off shoot of the Western ghats. It is set in gentle sloping woods abundant in bird life. The scenic way up by road runs through coffee plantations and thick forests. The pride of Kodaikanal is the Kurinji flower, which blossoms once in 12 years. Situated at 7000 feet above sea level the hill plantain fruits and plums are known for their freshness and taste. further sightseeing like bear shola falls, telescope house and coaker’s walk, Bryani’s park, Pillar rock Green valley view, silver cascade waterfalls etc. In the evening rest at the hotel. Overnight stay in Hotel, Kodaikanal. After breakfast drive to Ooty (250 Kms and 7 Hrs drives). Ooty & Kodaikanal is a beautiful hill station with Bracing climate at the height of 2133m. Check in at Hotel. Visit Dodda Betta Peak, which gives a view of Ooty from the heights of Nilgiri. Later move for seeing Conoor Tea Gardens, Sim’s Park offering some wonderful views of varieties of flowers & trees and Dolphin’s Nose which offers scenic beauty of small mountains, springs, tea gardens etc from the top. You can indulge in hiking, boating, trekking, and horse riding also. Overnight is in Ooty. After breakfast we take you for a visit to the Botanical Garden. 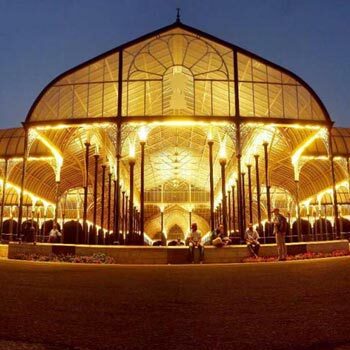 Botanical Garden in Ooty is well known and one of the oldest botanical garden in country. It is also special for its green lawns, rare trees, variety of different collections of flowering plants, clear watered pools etc. Enjoy the gardens and then transfer back to the hotel in the evening. Night stay is in Ooty. After breakfast drive to Mysore (142 Kms and 5 Hrs drives). Check in at Hotel. Proceeds sightseeing. Including: Mysore Palace, Chamarajendra Art Gallery, Mysore Zoo Gardens, St. Philomena’s Church, Temples, Chamundi Hills, Brindavan Gardens and Bylakuppa. Overnight at the hotel. Morning proceed for Tirupati (396kms. 9hrs. )Balaji Darshan.evening check in Hotel Take rest at Hotel Over Night. In The Morning start The Lord Sri Venkateswaraswamy is the all-pervading Lord of the Universe. Tirumala’s Balaji shrine is among the more famous temples of India. It reportedly attracts the largest number of pilgrims for any shrine in India. It also has a reputation of being one of the richest shrines in the world. overnight at Hotel. After Breakfast, check out hotel and drive to Bangalore. (240 Kms and 6 Hrs Drives) On arrival Bangalore, after check in into the hotel. 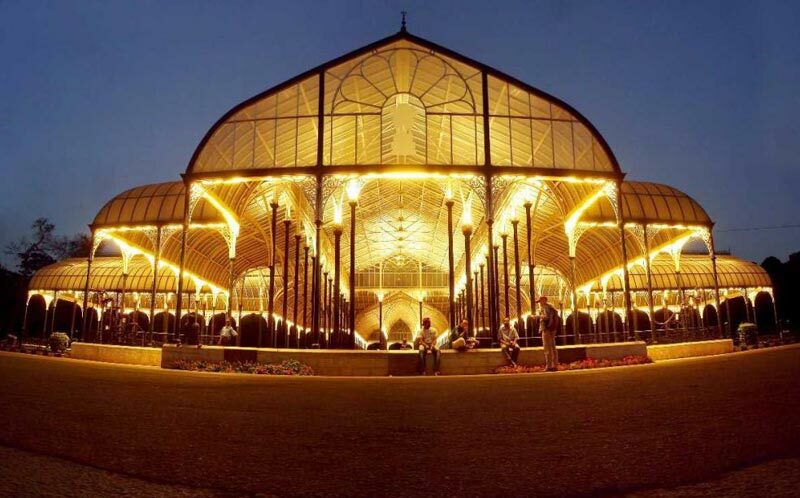 proceeds sight seeing, Including of Bangalore city visiting Vidhan Soudha, Lalbagh Botanical garden, Tipu Sultan’s palace and Bull temple – one of the oldest temples built in 16th century. Rest of the day is free at leisure. Overnight in the hotel.